I look forward to every episode! This podcast has helped me change my attitude and my outlook on life. Not only are Gretchin and Liz enjoyable hosts, but they truly have made my life happier! many helpful tips. easy to listen to. I discovered this podcast the year of the 2016 presidential election, and it totally saved my sanity and lifted my spirits! I started binge-listening until I got caught up! I am a huge fan of the podcast, website and books! So helpful!!! Why you might consider using gentle language, a gold star for “Winter of the Witch, a movie about magical pancakes, and listeners answer the question, “What’s the best resolution you’ve ever made?”<br><br>Get in touch: @gretchenrubin; @elizabethcraft; podcast@gretchenrubin.com; happiercast.com/205; 774-277-9336. Use the Checklist for Habit Change, how to encourage conversation with children, and the challenge of planning office birthday celebrations.<br><br>Get in touch: @gretchenrubin; @elizabethcraft; podcast@gretchenrubin.com; happiercast.com/202; 774-277-9336. Choose a one-word theme for the year, a talk with Chris Guillebeau, and what’s been your most significant resolution?<br><br>Get in touch: @gretchenrubin; @elizabethcraft; podcast@gretchenrubin.com; happiercast.com/201; 774-277-9336. To celebrate our 200thepisode, we answer questions from listeners: do we ever fight, how do we record the podcast, when did we choose our careers, and more.<br><br>Get in touch: @gretchenrubin; @elizabethcraft; podcast@gretchenrubin.com; happiercast.com/200; 774-277-9336. Design your happiness project for 2019, follow the five-second rule, and suggestions for dealing with the challenge of gift-giving.<br>Get in touch: @gretchenrubin; @elizabethcraft; podcast@gretchenrubin.com; happiercast.com/198; 774-277-9336. Plan to read more in 2019, how to make it easier to follow complex instructions, and what to do when your sweetheart won’t store keys in the key bowl.<br><br><br>Get in touch: @gretchenrubin; @elizabethcraft; podcast@gretchenrubin.com; happiercast.com/197; 774-277-9336. Make an introduction, accountability strategies to keep people exercising, and how to deal with digital information hoarding.<br><br>Get in touch: @gretchenrubin; @elizabethcraft; podcast@gretchenrubin.com; happiercast.com/194; 774-277-9336. Why you should have people over, how to make time for your side hustle, and the challenge of the “you cook, I clean” approach<br>&nbsp;<br>Get in touch: @gretchenrubin; @elizabethcraft; podcast@gretchenrubin.com; happiercast.com/192; 774-277-9336. These words are comforting because they’re true: you’re not that powerful. For this Very Special Episode, we focus on the role of the body in creating a happier life, and we talk to Jake Knapp about how to focus on what matters.<br><br>Get in touch: @gretchenrubin; @elizabethcraft; podcast@gretchenrubin.com; happiercast.com/190; 774-277-9336. Why you might want to make life more complicated, the challenge of the (non)<br>Quiet Car, and a question about hotels.<br><br>Get in touch: @gretchenrubin; @elizabethcraft; podcast@gretchenrubin.com; happiercast.com/189; 774-277-9336. Little mistakes, little missteps, can help us learn and grow so that we don’t make bigger mistakes later. For decades, I’ve been haunted by a public-service poster I once saw in a New York City subway. It has its drawbacks, to be sure, but in general, it’s good to be an adult. Take a scent snapshot of your life to boost your happiness, and Eliza describes facing the happiness stumbling block of leaving home for the first time.<br>Get in touch: @gretchenrubin; @elizabethcraft; podcast@gretchenrubin; happiercast.com/182; 774-277-9336. 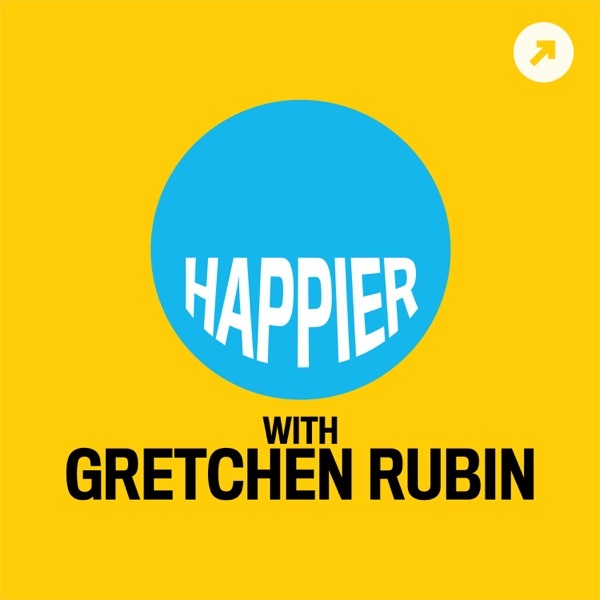 Practice reverse gossip, an email-related hack, and what to do when someone raises the bar.&nbsp;<br>Get in touch: @gretchenrubin; @elizabethcraft; podcast@gretchenrubin; happiercast.com/181; 774-277-9336. We got terrific hacks from listeners about how to make travel more convenient, comfortable, and fun—so many great suggestions about happier travels.<br>Get in touch: @gretchenrubin; @elizabethcraft; podcast@gretchenrubin; happiercast.com/180; 774-277-9336. One of my favorite moments in the Harry Potter books is when Harry accepts his own nature, and his own strengths, to face his dragon. Schedule a weekly playdate with yourself, a hack for dealing with a child’s curfew,<br>and what are some ways to deal with the distractions of an open-plan office?<br>Get in touch: @gretchenrubin; @elizabethcraft; podcast@gretchenrubin; happiercast.com/178; 774-<br>277-9336. Do the “ten minute closer” to help yourself make orderly transitions, what’s<br>luxury for you, and how to deal with demanding neighbors—plus the mystery of<br>shoe size!<br>Get in touch: @gretchenrubin; @elizabethcraft; podcast@gretchenrubin; happiercast.com/177; 774-<br>277-9336. Gold star and RIP to Bob Dorough, who made such a contribution to the world with his “Schoolhouse Rock” series. Sometimes, when people do things that seem inexplicable, there’s actually a very good explanation, if we take the time to find out what it is. Why it’s useful to know your purpose, the challenge of taking notes while listening to a podcast, and Brittany Luse and Eric Eddings of “The Nod” podcast talk about working with a close friend.<br>Get in touch: @gretchenrubin; @elizabethcraft; podcast@gretchenrubin; happiercast.com/173; 774-277-9336. Even rocket scientists can make a simple math error. Mistakes happen. Nobody’s perfect. Why we should question our limiting beliefs, how to create outer accountability for saying “no," and a hack using measuring cups.<br><br>Get in touch: @gretchenrubin; @elizabethcraft; podcast@gretchenrubin; happiercast.com/171; 774-277-9336. It makes me very happy to think of these three great artists taking such delight in their own powers, and persisting in their vision for years, until they finally got to do what they wanted—and made it a huge hit. We give an update on our progress (and lack of progress) in our “18 for 2018” lists. Get in touch: @gretchenrubin; @elizabethcraft; podcast@gretchenrubin; happiercast.com/170; 774-277-9336. Use the strategy to “Stop talking,” an interview about modern romance with Joanna Coles, and dealing with the end of a Season of Stress.<br>Get in touch: @gretchenrubin; @elizabethcraft; podcast@gretchenrubin; happiercast.com/169; 774-277-9336. I never take for granted the sight of the majestic Statue of Liberty, and it gives me my “America feeling” every time. Watch old video clips of celebrities, put-downers vs. put-awayers, and would you rather take one long vacation or several short ones?<br>Get in touch: @gretchenrubin; @elizabethcraft; podcast@gretchenrubin; happiercast.com/166; 774-277-9336. Don’t assign or accept homework, write an “unhappy list,” and a fun way to deal with a big milestone birthday.<br>Get in touch: @gretchenrubin; @elizabethcraft; podcast@gretchenrubin; happiercast.com/164; 774-277-9336. My father gave me some very valuable advice: There are no wizards. There are no magical fixers. If I care about something, I have to stay involved. Why you might “embrace the cheese,” a low-stress variety of book group, and the question of what to do with a Magic Hour.<br>Get in touch: @gretchenrubin; @elizabethcraft; podcast@gretchenrubin; happiercast.com/161; 774-277-9336. Gretchen and Elizabeth meet in Elizabeth’s home office to clear some clutter.<br>Get in touch: @gretchenrubin; @elizabethcraft; podcast@gretchenrubin; happiercast.com/75; 774-277-9336. Decide to do something badly, an interview with Adam Grant about his WorkLife podcast, and tips for dealing with the upheaval of a renovation.<br>Get in touch: @gretchenrubin; @elizabethcraft; podcast@gretchenrubin; happiercast.com/159; 774-277-9336. To celebrate our third anniversary, we highlight our most popular Try-This-at-Home tips, Happiness Hacks, and favorite moments.<br>Get in touch: @gretchenrubin; @elizabethcraft; podcast@gretchenrubin; happiercast.com/157; 774-277-9336. Why you might try having a kissing schedule, an easy way to make it easier to put down your phone, and discussion of Obliger accountability and conflicts about messiness. Get in touch: @gretchenrubin; @elizabethcraft; podcast@gretchenrubin; happiercast.com/156; 774-277-9336. I remind myself that what I do every day matters more than what I do once in a while—which means that an occasional slip-up is fine, and also that rare heroic efforts don’t matter much over the long term. Wear clothes every day (!) and an interview about parenthood with Tanya Coke. Get in touch: @gretchenrubin; @elizabethcraft; podcast@gretchenrubin; happiercast.com/154; 774-277-9336. Create a consistent body of work, use the Flic app to manage your photos, and a deep dive into the “18 for 2018” lists.Get in touch: @gretchenrubin; @elizabethcraft; podcast@gretchenrubin; happiercast.com/153; 774-277-9336. After watching the movie Lost Horizon, my daughter Eleanor gave a brilliant title to her “sequel”: Everyday Life in Utopia. That’s my life motto. Use the "Checklist for Habit Change" to help you change your habits in 2018, plus many holiday hacks from listeners. Get in touch: @gretchenrubin; @elizabethcraft; podcast@gretchenrubin.com; happiercast.com; 774-277-9336. Make a list of "18 for 2018," the challenge of in-laws who want to fill your empty closets with their clutter, and an instagram-related project. Get in touch: @gretchenrubin; @elizabethcraft; podcast@gretchenrubin.com; happiercast.com; 774-277-9336. A friend told me that during a tough time, “she’d been practically addicted to doing good deeds.” One of the best ways to make ourselves happy is to make other people happy; one of the best ways to make other people happy is to be happy ourselves. My mother helped me to reframe a situation so I felt lucky, rather than resentful, at my husband’s lack of interest in our renovation. Be willing to delegate, how a Rebel child started to cry less in class, and is it possible to make yourself happier?Get in touch: @gretchenrubin; @elizabethcraft; podcast@gretchenrubin; happiercast.com/144; 774-277-9336. I love the opening passage from “Charlotte’s Web,” E. B. White’s masterpiece of children’s literature. It’s a great reminder that an ordinary day can remind us of the most transcendent values. Schedule some daily transcendence, skip the bad parts, and a conversation with Lewis Howes. Get in touch: @gretchenrubin; @elizabethcraft; podcast@gretchenrubin.com; happiercast.com/142; 774-277-9336. A teaching story about Torah study from Wendy Mogel’s book “The Blessing of a Skinned Knee” is a terrific reminder that a good example is more compelling than good advice. In this Very Special Episode, we hear from listeners on what they consider the best and worst things to say in different situations. Get in touch: @gretchenrubin; @elizabethcraft; podcast@gretchenrubin.com; happiercast.com/140; 774-277-9336. During our senior year of college, a friend made a remark that I’ve always remembered: don’t wait until you’re moving out to clean your apartment. After it’s clean, you realize how nice it was all along. How to be a good guest, what to do if you don't want to act as an accountability partner - and Elizabeth grills for the first time. Get in touch: @gretchenrubin; @elizabethcraft; podcast@gretchenrubin.com; happiercast.com/139; 774-277-9336. When I was talking to my father about whether my family should make a very short trip to Kansas City, he made a very wise observation: frequency is more important than duration. Always leave some room in the suitcase, the stress of giving a toast, and what to bring to the office if you don't want to be the evil donut-bringer. Get in touch: @gretchenrubin; @elizabethcraft; podcast@gretchenrubin.com; happiercast.com/137; 774-277- 9336. It’s often easy to assume that now isn’t the right time—but the best time to do something is now. It’s “Take Your Sister to Work Day!” Gretchen visits Elizabeth at her office in Burbank. Get in touch: @gretchenrubin; @elizabethcraft; podcast@gretchenrubin.com; happiercast.com/138; 774-277- 9336. My sister the sage Elizabeth told me that “People succeed in groups.” I think that’s objectively true, and in any event, it’s a helpful thought. Why it's helpful not to let yourself fall into "empty," how a smartphone can be a memory aid, and dealing with the common challenge of photo anxiety. Get in touch: @gretchenrubin; @elizabethcraft; podcast@gretchenrubin.com; happiercast.com/136; 774-277-9336. I’ve read many memoirs written by people I know in real life. And it always reminds me of a very important truth: we should always cut people slack. Plan a virtual move 2.0, the satisfaction of finding the perfect solution to even a small problem, and a<br>brief conversation with writer Ann Brashares, who made a listener very happy. Get in touch: @gretchenrubin; @elizabethcraft; podcast@gretchenrubin.com; happiercast.com/135; 774-277-9336. Some rhyming advice I learned in law school turns out to apply in many situations in life. In the Acknowledgements of B.J. Novak’s excellent book “One More Thing,” he remembers to pay tribute to some friends from childhood. Why you might consider reading children’s literature, how to reinvigorate your work space if you can’t make any changes, and the question of whether you can change your Tendency. Get in touch: @gretchenrubin; @elizabethcraft; podcast@gretchenrubin.com;<br>happiercast.com/132; 774-277- 9336. The dull task of grading papers inspired J.R.R. Tolkien to write the first line of his masterpiece, “The Hobbit.” Boredom can lay the groundwork for great creativity. Do ten jumping jacks, how to stop constantly checking your devices, and why life<br>is like high school. Get in touch: @gretchenrubin; @elizabethcraft; podcast@gretchenrubin.com;<br>happiercast.com/131; 774-277- 9336. Instead of joining in the commiseration, my friend took action to help. Sometimes, it’s better to help than to sympathize. In this Very Special Episode, we discuss the seven myths of happiness. Get in touch:<br>@gretchenrubin; @elizabethcraft; podcast@gretchenrubin.com; happiercast.com/130; 774-277-9336. This conversation happened 23 years ago, and lasted about five minutes, but I’ve regretted it ever since. Why we should remember that September is the other January, the fun of personalized post-it notes, and the challenge of what “they” think. Get in touch: @gretchenrubin; @elizabethcraft; podcast@gretchenrubin.com; happiercast.com/129; 774-277-9336. Why it’s helpful to connect with TV, a way to give up the snooze alarm, and a discussion of whether you can be a mix of the Four Tendencies. Get in touch: @gretchenrubin; @elizabethcraft; podcast@gretchenrubin.com; happiercast.com/128; 774-277-9336. Why we should make or accept a repair attempt, a Sharpie hack, and how introverted Obligers can create outer accountability. Get in touch: @gretchenrubin; @elizabethcraft; podcast@gretchenrubin.com; happiercast.com/127; 774-277-9336. Sometimes in life, going down one path means abandoning another path. It’s natural to feel regret about the path not taken. My daughter’s pre-school teachers used to tell the kids “You get what you get, and you don’t get upset,” and I’ve found this to be extremely useful advice. One of my Secrets of Adulthood is “The opposite of a profound truth is also true.”&nbsp; A few weeks ago I talked about the advice, “Check every box.” Listeners reminded me of another piece of excellent advice, “Don’t check every box. Just go for it!”&nbsp; Very true. My law school friend repeated the advice that she’d been given: Try to check every box. This advice came to me in an indirect way, but I’ve followed it ever since. Eighteen years ago, on a plane to Kansas City, I had a brief encounter with a woman—and I’ve regretted my action (or rather, inaction) ever since. Sometimes, we can be generous by taking. Why it boosts happiness to make friends with people of different ages, look behind you every time you leave, and the happiness stumbling block of pain. Get in touch: @gretchenrubin; @elizabethcraft; podcast@gretchenrubin.com; happiercast.com/119; 774-277-9336. In Russell Hoban’s brilliant picture book “A Bargain for Frances,” Frances observes, “Being careful is not as much fun as being friends. Do you want to be careful, or do you want to be friends?” An important question for adults as well as children. One of the most terrible wastes of time is to do something well that we need not do at all. I often think of this old joke in the context of habit change: If we want to find what we’re looking for, we have to search in the right place. One of my favorite passages from “The Lion, the Witch, and the Wardrobe” holds a terrific happiness reminder: we can always try minding our own business. The great teacher is experience. A tough teacher, but a great teacher. Turn your shower into a "happiness booth," the self-knowledge question inspired by the movie "Before Sunrise," and the challenge of saying "no" to your boss. Get in touch: @gretchenrubin; @elizabethcraft; podcast@gretchenrubin.com; happiercast.com/108; 774.277.9336. Even if it’s not necessary, it’s sweet when our efforts are appreciated. In romance and in work, it’s helpful to have more than one thing going at a time. One of my mother’s favorite teaching stories is a reminder that we can never know what’s good news, or bad news. My sister the sage made one of her wise observations--which she learned the hard way, in Hollywood. We can’t find more happiness, more adventure, more richness to an experience that we bring to it. There are few iron laws of the universe, but one such law seems to be: No deposit, no return. We never get out of things more than we put into them. Do something for your future self, think about whether you’re an “integrator” or “compartmentalizer,” and how flying wish paper can soothe heartache. Get in touch: @gretchenrubin; @elizabethcraft; podcast@gretchenrubin.com; happiercast.com/101; 774-277-9336. A passage from Ruth Ozeki’s novel “A Tale for the Time Being” provides a beautiful image of letting go of sorrow. To celebrate our 100th consecutive episode, we did a Very VERY Special Episode, where we answered questions from listeners. Get in touch: @gretchenrubin; @elizabethcraft; podcast@gretchenrubin.com; happiercast.com/100; 774-277-9336. My friend told me the story of her personal miracle: the time her local subway ran express all the way downtown. Get self-insight by taking personality quizzes, a hack for better emails, and how to address book club conflicts. Get in touch: @gretchenrubin; @elizabethcraft; podcast@gretchenrubin.com; happiercast.com/99; 774-277-9336. Why it boosts happiness to have a quest, an interview with Gary Taubes about the case against sugar, and impassioned praise for a Uniqlo vest. Get in touch: @gretchenrubin; @elizabethcraft; podcast@gretchenrubin.com; happiercast.com/98; 774-277-9336. How to start your own happiness project, a deep dive into the subject of break-ups, and a sweatpants-related demerit. Get in touch: @gretchenrubin; @elizabethcraft; podcast@gretchenrubin.com; happiercast.com/97; 774-277-9336. Reading Harold Nicolson’s reflection that an “Englishman would not like to take snapshots of a fine vessel sinking” reminds me to ask myself: How, in my own life, can I live up to the highest ideas of my country? Set your holiday intention, tackle the problem of shared work, identify some inexpensive gifts—and how to make a graham-cracker holiday house. Get in touch: @gretchenrubin; @elizabethcraft; podcast@gretchenrubin.com; happiercast.com/96; 774-277-9336. We never know the true consequences of our actions, big or small, for good or for ill.
Why it’s helpful to practice mis-en-place, the tragedy of the messy commons in the office kitchen, and a gold star related to the flu vaccine. Get in touch: @gretchenrubin; @elizabethcraft; podcast@gretchenrubin.com; happiercast.com/95; 774-277-9336. A fun exercise is to choose a one-word theme for the new year, such as Novel, Travel, Rest, Free, Finish, Upgrade. Get in touch: @gretchenrubin; @elizabethcraft; podcast@gretchenrubin; happiercast.com; 774-277-9336. Find something to admire, figure out your energy level, and how to survive an (amicable) romantic split. Get in touch: @gretchenrubin; @elizabethcraft; podcast@gretchenrubin.com; happiercast.com/93; 774-277-9336. During the busy holiday season, remember to carve out some time for rest and silence. Get in touch: @gretchenrubin; @elizabethcraft; podcast@gretchenrubin; happiercast.com; 774-277-9336. For the holidays, leave something unsaid, an interview with Note to Self’s Manoush Zomorodi, and how taking seconds might help you eat more healthfully. Get in touch: @gretchenrubin; @elizabethcraft; podcast@gretchenrubin.com; happiercast.com/92; 774-277-9336. In Willa Cather’s novel “O Pioneers!” a sister and brother&nbsp; never forget the wild duck they saw playing in the river. Control the cubicle in your pocket, send an actual invitation to an event, and consider the question: "If people could change one of your habits, what would they pick?" Get in touch: @gretchenrubin; @elizabethcraft; podcast@gretchenrubin.com; happiercast.com/89; 774-277-9336. Why it's fun to celebrate holiday breakfasts, how keeping a journal for medical visits can make life easier, and the challenge of handling criticism. Get in touch: @gretchenrubin; @elizabethcraft; podcast@gretchenrubin.com; happiercast.com/88; 774-277-9336. A story from the life of St. Therese of Lisieux is a good reminder about how to accept a gift in the right spirit. When we follow our natural interests and inclinations, it’s surprising how often we form the relationships that can help us succeed. In a happy life, it’s helpful to keep a little space completely clear and open, but it’s also helpful to make room for some messiness, some unexpected treasure. The artist Frank Stella’s remark is a happiness koan; it has great meaning, though it’s not exactly clear what that meaning is. Justice Sandra Day O’Connor manages to sum up her secret of happiness in just three words. Why it's satisfying to introduce a specific topic into a conversation, why you might want to park at the far end of the parking lot - and is it acceptable to ignore the Olympics? Get in touch @gretchenrubin; @elizabethcraft; podcast@gretchenrubin.com; happiercast.com/81; 774-277-9336. Why a boy didn’t play with the toys his grandmother gave him. In a few words on a postcard to a fan, Ray Bradbury makes a key point about happiness. We don’t have to pretend that the people we love are perfect. Sisters Nora Ephron and Delia Ephron--and the reminder that there are many kinds of love. Ep. 77: We talk about why it's fun to plan an "errand date," a happiness hack for dealing with other people's clutter, abd the value of improving the nasty areas of your home. Get in touch: @gretchenrubin; @elizabethcraft; podcast@gretchenrubin.com; happiercast.com/77; 774-277-9336. Ep. 76: Why it's stimulating to write your manifesto; the joy of bringing your own condiments; and a listener requests suggestions for great wedding readings. Get in touch: @gretchenrubin; @elizabethcraft; podcast@gretchenrubin.com; happiercast.com/76; 774-277-9336. Why it’s fun to become a minor expert (like color or Real Housewives)—and also fun to use the app TimeHop, to spark happy memories. We do a deep dive into the choice of a signature color and discuss how to help a Rebel sweetheart apply for a job. Get in touch: @gretchenrubin; @elizabethcraft; podcast@gretchenrubin.com; happiercast.com/75; 774-277-9336. Why General Eisenhower’s 15-word telegram in 1945 was more powerful than any longer, more elaborate message would have been.<br><br>This episode is brought to you by Better Than Before, the book Gretchen wrote about how to make or break your habits. To learn more about the book, go to GretchenRubin.com. Ep. 74: Choose your "senior quote," use the powerful Strategy of Pairing to change your habits, and we also talk quite a bit about the Four Tendencies. Want to get in touch? @gretchenrubin; @elizabethcraft; podcast@gretchenrubin.com; happiercast.com/74; 774-277-9336. Why we should get rid of something (like a shoe without a mate) as soon as it's useless; what to do when everything "turns to ashes," as recently happened to Elizabeth--and something beautiful that's yours for free. Want to get in touch? @gretchenrubin; @elizabethcraft; podcast@gretchenrubin.com; happiercast.com/73; 774-277-9336. Ep. 72: Why we’re happier when we have room of our own, the challenge of the “incomplete upgrade,” and Gretchen gives herself a demerit for a parenting mistake.&nbsp; Want to get in touch? @gretchenrubin; @elizabethcraft; podcast@gretchenrubin.com; happiercast.com/72; 774-277-9336. When she's feeling insecure, Gretchen reminds herself of this Secret of Adulthood. &nbsp;<br><br>This episode is brought to you by Squarespace. Start building your website and get your free trial today. Go to Squarespace.com and enter offer code HAPPIER to get 10% off your order. Ep. 71: Choose a signature color, ask yourself, "Am I an alchemist or a leopard?" -- and fighting FOMO. Want to get in touch? @gretchenrubin; @elizabethcraft; podcast@gretchenrubin.com; happiercast.com/71; 774-277-9336. In his memoir, actor Rob Lowe recounts a conversation between his young son and President Clinton that shows that sometimes, we can be generous by taking. In this case, the President accepts a tattered stuffed frog.<br><br>This episode is brought to you by Squarespace. Start building your website and get your free trial today. Go to Squarespace.com and enter offer code HAPPIER to get 10% off your order. Back in episode 59, Elizabeth and Gretchen discussed lucky charms. That conversation reminded Gretchen of a charming (and possibly apocryphal) story about physicist Niels Bohr and a lucky horseshoe. Even if we’re not superstitious, we may be a littlestitious.<br><br>This episode is brought to you by Squarespace. Start building your website and get your free trial today. Go to Squarespace.com and enter offer code HAPPIER to get 10% off your order. Ep. 69: Gretchen and Elizabeth discuss why we should give someone a surprise treat, and address, yet again, the thought-provoking subject of thank-you notes. They also talk to a special guest: the iconic musician and writer, Moby. And in a rare move, both Gretchen and Elizabeth give themselves gold stars. Want to get in touch? @gretchenrubin; @elizabethcraft; podcast@gretchenrubin.com; happiercast.com/69; 774-277-9336. We've all heard the expert advice: do it for 30 days; do it first thing in the morning; start small. Problem? That advice works for some people, but it doesn't work for everyone. There's no single answer for happiness and good habits.&nbsp;<br><br>This episode is brought to you by Squarespace. Start building your website and get your free trial today. Go to Squarespace.com and enter offer code HAPPIER to get 10% off your order. Ep. 68: How to be on time, why we should treat ourselves, how an Obliger can stick to a budget, and Elizabeth is thrilled with an app that lets her scan documents.&nbsp; Want to get in touch? @gretchenrubin; @elizabethcraft; podcast@gretchenrubin.com; happiercast.com/68; 774-277-9336. Do you ever feel as though you’re just repeating yourself, instead of doing the best work you can do? Picasso did.&nbsp;<br><br>This episode is brought to you by Squarespace. Start building your website and get your free trial today. Go to Squarespace.com and enter offer code HAPPIER to get 10% off your order. Ep. 67: Design your summer, a deep-dive into the emotionally charged subject of thank-you notes, mother-in-law woes, and the problem of the partial move.&nbsp; Want to get in touch? @gretchenrubin; @elizabethcraft; podcast@gretchenrubin.com; happiercast.com/67; 774-277-9336. In their own way W. H. Auden and Flannery O’Connor each articulate an idea that I think about often: I want to accept myself, and also expect more from myself.<br><br>This episode is brought to you by Squarespace. Start building your website and get your free trial today. Go to Squarespace.com and enter offer code HAPPIER to get 10% off your order. Ep. 66: Give advice only when asked, and the challenges of email etiquette and vacation hangovers. Want to get in touch? @gretchenrubin; @elizabethcraft; podcast@gretchenrubin.com; happiercast.com/66; 774-277-9336. Ep. 65: Enjoy your home's special features, Arianna= Huffington talks about why we should get enough sleep, and I give a gold star to my children's literature reading groups.&nbsp; Want to get in touch? @gretchenrubin; @elizabethcraft; podcast@gretchenrubin.com; happiercast.com/65; 774-277-9336. Ep. 64: Go slow to go fast; what do you lie about&nbsp;(Elizabeth and I confess our lies), and we introduce a new segment, the&nbsp;"Happiness Hack." My hack is trivial, but a happiness-booster. &nbsp;Want to get in touch? @gretchenrubin; @elizabethcraft;&nbsp;podcast@gretchenrubin; happiercast.com/64; 774-277-9336. I was riding the bus with my daughter, when something outside the window caught her eye...<br><br>This episode is brought to you by Audible.com. Go to Audible.com/Happier for an audiobook of your choice, and a free 30 day trial. Ep. 63: Why it's important to have a strategy for online passwords, the trickiness of using rewards to strengthen habits, and Elizabeth and I debate a question about thank-you notes.&nbsp; Want to get in touch? @gretchenrubin; @elizabethcraft; podcast@gretchenrubin.com; happiercast.com/63; 774-277-9336. My mom simply asked if she could come to New York for a visit...&nbsp;<br><br>This episode is brought to you by Audible.com. Go to Audible.com/Happier for an audiobook of your choice, and a free 30 day trial. Ep. 62: Don't accumulate excessive amounts of anything; it's tough when worlds collide; a Questioner wants to be a better spouse to an Obliger, and I fail to visit Central Park--again.&nbsp; Want to get in touch? @gretchenrubin; @elizabethcraft; podcast@gretchenrubin.com; happiercast.com/62; 774-277-9336. Get some fresh air and sunlight. It's an easy way to stimulate your brain and boost your memory, alertness, and wellbeing.&nbsp;<br><br>Brought to you by Audible, with 180,000 audio books and spoken word audio products. Go to audible.com/happier for a 30-day trial. Ep. 61: Stop apologizing, do you prefer variety or familiarity, and the problem of passwords.&nbsp; Want to get in touch? @gretchenrubin; @elizabethcraft; podcast@gretchenrubin.com; happiercast.com/61; 774-277-9336. This is one of my all time favorite secrets of adulthood, because it's true for so many people, and it's so accessible. Outer order contributes to inner calm.&nbsp;<br><br>Brought to you by Audible, with 180,000 audio books and spoken word audio products. Go to&nbsp;<a href="http://www.audible.com/mt/STSY?source_code=PDTGBPD07101500CX">audible.com/happier</a>&nbsp;for a 30-day trial. Ep. 60: A Very Special Episode. Henry and I visit Elizabeth on the set, and discuss you should let people do their jobs, interview Helen Childress, and hear a guest gold star from Elizabeth's writing partner<br>Sarah Fain. Want to get in touch? @gretchenrubin; @elizabethcraft; podcast@gretchenrubin.com; happiercast.com/60; 774-277-9336. Ep. 59: Find your lucky charm, distract yourself for 15 minutes, some great mantras from listeners -- and Elizabeth feels godparent guilt. Want to get in touch? @gretchenrubin; @elizabethcraft; podcast@gretchenrubin.com; happiercast.com/59; 774-277-9336. Often we're afraid to tell people exactly what we want for fear of sounding demanding. But by holding back, we may be denying our friends and family the opportunity to experience the pleasure of giving.&nbsp;<br><br>Brought to you by Audible, with 180,000 audio books and spoken word audio products. Go to&nbsp;<a href="http://www.audible.com/mt/STSY?source_code=PDTGBPD07101500CX">audible.com/happier</a>&nbsp;for a 30-day trial. Ep. 58: Find your area of refuge, the pressure of birthdays, and how to get up earlier.&nbsp; Want to get in touch? @gretchenrubin; @elizabethcraft; podcast@gretchenrubin.com; happiercast.com/58; 774-277-9336. Last week was full of deadlines and travel arrangements and all around stress. Fortunately, when this happens, Gretchen Rubin knows the perfect trick to charge her own personal battery and get back on track.&nbsp;<br><br>Brought to you by Audible, with 180,000 audio books and spoken word audio products. Go to&nbsp;<a href="http://www.audible.com/mt/STSY?source_code=PDTGBPD07101500CX">audible.com/happier</a>&nbsp;for a 30-day trial. Ep. 57: Pick a mantra for the day, avoid the awful habit of "awfulizing," and dealing with "The Chair" where clothes collect. Want to get in touch? @gretchenrubin; @elizabethcraft; podcast@gretchenrubin.com; happiercast.com/57; 774-277-9336. Gretchen Rubin remembers few specific facts from college. But she can recall a couple lessons vividly, and they both have this one thing in common.&nbsp;<br><br>Brought to you by Audible, with 180,000 audio books and spoken word audio products. Go to&nbsp;<a href="http://www.audible.com/mt/STSY?source_code=PDTGBPD07101500CX">audible.com/happier</a>&nbsp;for a 30-day trial. Ep. 56: Schedule time to worry, learn to avoid loopholes, and how to deal with a writers' accountability group that is starting to shirk writing. Want to get in touch? @gretchenrubin; @elizabethcraft; podcast@gretchenrubin.com; happiercast.com/56; 774-277-9336. Ep. 55: The dilemma of switching bags, do you prefer long or short discussions, the story of the Monkey and the Banana--and scratch-n-sniffs! Want to get in touch? @gretchenrubin; @elizabethcraft; podcast@gretchenrubin.com; happiercast.com/55; 774-277-9336. Ep. 54: Our one-year anniversary! We talk about the most popular try-this-at-home tips, listeners give their before-and-after stories, and we highlight our favorite moments.&nbsp; Want to get in touch? @gretchenrubin; @elizabethcraft; podcast@gretchenrubin.com; happiercast.com/54; 774-277-9336. Ep. 53: Put the word "meditation" before any dull task, consider the stumbling block of competitive parenting, and listener ideas for storing recipes. Want to get in touch? @gretchenrubin; @elizabethcraft; podcast@gretchenrubin.cpm; happiercast.com/53; 774-277-9336. Ep. 52: Ask yourself, "What happens if I ignore this?" an interview with Whole30's Melissa Hartwig, I struggle with an unwanted errand, and Elizabeth discloses her favorite reality TV podcasts.&nbsp; Want to get in touch? @gretchenrubin; @elizabethcraft; podcast@gretchenrubin.com; happiercast.com/52; 774-277-9336. Ep. 51: How to disguise the fact that you don't remember someone's name; why if-then planning helps us to keep good habits, the challenge of returning family phone calls--and adult coloring books! Want to get in touch? @gretchenrubin; @elizabethcraft; podcast@gretchenrubin.com; happiercast.com/51; 774-277-9336. Ep. 50: Why you should ask for a favor, cooperation vs. competition, information overload, and I don't do a good job handling my daughter's request for more ear-piercings.&nbsp; Want to get in touch? @gretchenrubin; @elizabethcraft; podcast@gretchenrubin.com; happiercast.com/50; 774-277-9336. Ep. 49: Live from San Francisco! With special guests Nir Eyal and Jake Knapp. Plus how to travel with tears, deal with public speaking -- and Elizabeth identifies her favorite new place in San Francisco. Want to get in touch? @gretchenrubin; @elizabethcraft; podcast@gretchenrubin.com; happiercast.com/49; 774-277-9336. Ep. 48: Create a temporary photo gallery, the happiness challenge of the Sunday blues, and the joy of listening to the Harry Potter audio-books.&nbsp; Want to get in touch? @gretchenrubin; @elizabethcraft; podcast@gretchenrubin.com; happiercast.com/48; 774-277-9336. Ep. 47: Control your exit, harness the power of convenience, and Elizabeth misses out on the opportunity to have a romantic moment with Adam.&nbsp; Want to get in touch? @gretchenrubin; @elizabethcraft; podcast@gretchenrubin.com; happiercast.com/47; 774-277-9336. Ep. 46: Don't get organized, dealing with storing sentimental items, coping with rewards and treats -- and we hit five million downloads!&nbsp; Want to get in touch? @gretchenrubin; @elizabethcraft; podcast@gretchenrubin.com; happiercast.com/46; 774-277-9336. Ep. 45: Elizabeth and I are both home for the holidays, back in Kansas City. We start the episode in our favorite KC diner, Winstead's, then talk to some special guests. Want to get in touch? @gretchenrubin; @elizabethcraft; podcast@gretchenrubin.com; happiercast.com/45; 774-277-9336. Ep. 44: Drew Barrymore interview! So fascinating. Plus we talk about having an end-of-the-year ritual, procrastinating about Christmas decorations, and the joy of temporary tattoos.&nbsp; Want to get in touch? @gretchenrubin; @elizabethcraft; podcast@gretchenrubin.com; happiercast.com/44; 774-277-9336. Ep. 43: Listener Roundup of the Four Tendencies. Want to get in touch? @gretchenrubin; @elizabethcraft; podcast@gretchenrubin.com; happiercast.com/43; 774-277-9336. Ep. 42: Act the way you want to feel; try resisting temptation by abstaining altogether; and I use the Strategy of Convenience to get back to the gym.&nbsp; Want to get in touch? @gretchenrubin; @elizabethcraft; podcast@gretchenrubin.com; happiercast.com/42; 774-277-9336. Ep. 41: Take one thing with you to fight clutter, tackle the challenge of impulse buying -- and I haven't been going to the gym. Want to get in touch? @gretchenrubin; @elizabethcraft; podcast@gretchenrubin.com; happiercast.com/41; 774-277-9336. Ep. 40: Very Special Episode, holiday theme! Listeners answer: "What's your Try This at Home tip for the holidays?" and "What's the essential element of the holidays, for you?" Want to get in touch? @gretchenrubin; @elizabethcraft; podcast@gretchenrubin.com; happiercast.com/40; 774-277-9336. Ep. 39: Elizabeth talks about getting fired; do you want more time for friends or for solitude; and Elizabeth gets a surprise dinner. Want to get in touch? @gretchenrubin; @elizabethcraft; podcast@gretchenrubin.com; happiercast.com/39; 774-277-9336. Ep. 38: A close look at the Rebel Tendency. Do you hate being told what to do--even telling yourself what to do? Want to get in touch? @gretchenrubin; @elizabethcraft; podcast@gretchenrubin.com; happiercast.com/38; 774-277-9336. Ep. 37: A close look at the Obliger Tendency. Are you like Elizabeth, and find it easy to meet outer expectations (a work deadline) but struggle to meet inner expectations (New Year's resolution)? Want to get in touch? @gretchenrubin; @elizabethcraft; podcast@gretchenrubin.com; happiercast.com/37; 774-277-9336. Ep. 36: We're talking about the Four Tendencies Framework, and this week, we focus on the Questioner Tendency, with the help of Christy Fletcher. Want to get in touch? @gretchenrubin; @elizabethcraft;<br>podcast@gretchenrubin.com; happiercast.com/36; 774-277-9336. Ep. 35: In the first of four episodes about the Four Tendencies framework, we talk about "Upholders." Also, Elizabeth misses the blood moon and Gretchen recommends a Jewel video. Want to get in touch? @gretchenrubin; @elizabethcraft; podcast@gretchenrubin.com; happiercast.com/35; 774-277-9336. Ep. 34: Have a difficult conversation; a talk with Lisa Randall, Harvard physics professor and Writer (and Rebel) -- plus, hard-boiled eggs. Want to get in touch? @gretchenrubin; @elizabethcraft; podcast@gretchenrubin.com; happiercast.com/34; 774-277-9336. Ep. 33: Try a boot camp, put away those last items -- and have you ever experienced a "Lightning Bolt" change in your habits? I have. Want to get in touch? @gretchenrubin; @elizabethcraft; podcast@gretchenrubin.com; happiercast.com/33; 774-277-9336. Ep. 32: Why Elizabeth and I raise the bar; why, surprisingly, teasing can be a happiness stumbling block--and we want your comments about the Four Tendencies!&nbsp; Want to get in touch? @gretchenrubin; @elizabethcraft; podcast@gretchenrubin.com; happiercast.com/32; 774-277-9336. Ep. 31: Observe a threshold ritual, for gratitude; identify your personal symbols; and remember to check your passport's expiration date. Want to get in touch? @gretchenrubin; @elizabethcraft; podcast@gretchenrubin.com; happiercast.com/31; 774-277-9336. Ep. 30: Very Special Episode! My daughter Eliza is our guest. Her try-this-at-home is "Give yourself a mission." She asks: "What advice would you give your 16-year-old self?" Too many facial products, so happy to be getting a dog.&nbsp; Want to get in touch? @gretchenrubin; @elizabethcraft; podcast@gretchenrubin.com; happiercast.com/30; 774-277-9336. Ep. 29: Why Elizabeth and I lower the bar ("don't let the perfect be the enemy of the good"), use the clean slate to change habits, and try to end food waste.&nbsp; Want to get in touch? @gretchenrubin; @elizabethcraft; podcast@gretchenrubin.com; happiercast.com/29; 774-277-9336. Ep. 28: Don't interview for pain; face the challenge of shared work--and whether or not to keep ice cream in the freezer.&nbsp; Want to get in touch? @gretchenrubin; @elizabethcraft; podcast@gretchenrubin.com; happiercast.com/28; 774-277-9336. Ep. 27: Need to make an important decision? Choose the bigger life. Also, what's your "tell"?--and I reveal whether we're getting a dog. (What's your guess? )&nbsp; Want to get in touch? @gretchenrubin; @elizabethcraft; podcast@gretchenrubin.com; happiercast.com/27; 774-277-9336. Ep. 26: Pick a one-word theme for the year. Want to get in touch? @gretchenrubin; @elizabethcraft; podcast@gretchenrubin.com; happiercast.com/26; 774-277-9336. Ep. 25: Hilarious writer A. J. Jacobs suggests several try-this-at-home tips: improve your posture; brainstorm for fifteen minutes; sustainable honesty; eat from the fridge, not the pantry. Want to get in touch? @gretchenrubin; @elizabethcraft; podcast@gretchenrubin.com; happiercast.com/25; 774-277-9336. Ep. 23: Why you should choose an office TV show; when enjoying something, do you prefer to "savor" or "spree," how to keep healthy habits while traveling; and why it's great to have a lovey-dovey husband. Want to get in touch? @gretchenrubin; @elizabethcraft; podcast@gretchenrubin.com; happiercast.com/23; 774-277-9336. Ep. 22: We have a theme this week -- creativity! Save Your String, Listen to Rosanne Cash, Fight Drift, and a Lesson from the Writers' Room. Want to get in touch? @gretchenrubin; @elizabethcraft; podcast@gretchenrubin.com; happiercast.com/22; 774-277-9336. Ep. 21: Why it's a good idea to join or start a group, and also to put something on the schedule. Also, how to enjoy the present moment -- and Elizabeth again celebrates her treadmill desk. Want to get in touch? @gretchenrubin; @elizabethcraft; podcast@gretchenrubin.com; happiercast.com/21; 774-277-9336. Ep. 20: Listen to listeners! We hear answers to the question, "If you could change one aspect of a relationship, what would you change?" and people's demerits and gold stars.&nbsp; Want to get in touch? @gretchenrubin; @elizabethcraft; podcast@gretchenrubin.com; happiercast.com/20; 774-277-9336. Ep. 18: Buy an experience, use the Strategy of Foundation (eat and drink right, sleep, move, and unclutter) and the challenge of good table manners.&nbsp; Want to get in touch? @gretchenrubin; @elizabethcraft; podcast@gretchenrubin.com; happiercast.com/18; 774-277-9336. Ep. 17: Why it's a good idea to have an exact place for everything; beware of anything we call "our preciousss," the challenge of staying in touch, and how to re-frame the experience of plane<br>rides.&nbsp; Want to get in touch? @gretchenrubin; @elizabethcraft; podcast@gretchenrubin.com; happiercast.com/17; 774-277-9336. Ep. 16: Imitate a spiritual master, use the Strategy of Monitoring to improve your habits, stay happy through transitions--and acknowledge pink eye right away.&nbsp; Want to get in touch? @gretchenrubin; @elizabethcraft; podcast@gretchenrubin.com; happiercast.com/16; 774-277-9336. Ep. 15: Be a tourist in your own city, a talk with Tom Rath, the challenge of snooze alarms, Gretchen's deep appreciation of clear plastic sleeves to organize papers, and Elizabeth's bad habit of asking the<br>same question repeatedly.&nbsp; Want to get in touch? @gretchenrubin; @elizabethcraft; podcast@gretchenrubin.com; happiercast.com/15; 774-277-9336. Ep. 14: Cultivate a shrine, know what's different about you to figure out how to set up your habits for success, and -- do you suffer from hostess neurosis? Want to get in touch? @gretchenrubin; @elizabethcraft; podcast@gretchenrubin.com; happiercast.com/14; 774-277-9336. Ep. 13: Why you should stop reading a book, a know-yourself-better quiz (are you an Upholder, Questioner, Obliger, or Rebel? ), and the trap of free stuff.&nbsp; Want to get in touch? @gretchenrubin; @elizabethcraft; podcast@gretchenrubin.com; happiercast.com/13; 774-277-9336. Ep. 12: Why it can be a good idea to indulge in a modest splurge, Tiggers vs. Eeyores, the challenge of road rage, and April Fool's Day pranks. Want to get in touch? @gretchenrubin; @elizabethcraft; podcast@gretchenrubin.com; happiercast.com/12; 774-277-9336. Ep. 11: Why we should "make the positive argument," are you a simplicity-lover or an abundance-lover, why it's hard to do the things that make us happy--and Elizabeth's sunscreen confession.&nbsp; Want to get in touch? @gretchenrubin; @elizabethcraft; podcast@gretchenrubin.com; happiercast.com/11; 774-277-9336. Ep. 10: We recorded this episode as we observed one of our sisterly rituals: when we're together, we clean Elizabeth's closet. Hilarious discussion of many clutter-clearing ideas. Want to get in touch? @gretchenrubin; @elizabethcraft; podcast@gretchenrubin.com; happiercast.com/10; 774-277-9336. Ep. 9: Treat yourself, but be wary of invoking "YOLO"; the challenge of changing someone else's habit; Elizabeth TPs a friend's house. Want to get in touch? @gretchenrubin; @elizabethcraft; podcast@gretchenrubin.com; happiercast.com/9; 774-277-9336. Ep. 8: Why we should give warm hellos and good-byes, ask ourselves what we did for fun when we were ten years old, and cultivate an atmosphere of growth.&nbsp; Want to get in touch? @gretchenrubin; @elizabethcraft; podcast@gretchenrubin.com; happiercast.com/8; 774-277-9336. Ep. 7: Treat yourself like a toddler, consider the "oppositional conversational style" (a/ka/ "I'm right, you're wrong"), what to do if other people won't cooperate with a habit change, and the benefits of lowered expectations. Want to get in touch? @gretchenrubin; @elizabethcraft; podcast@gretchenrubin.com; happiercast.com/7; 774-277-9336. Ep. 6: Try the habit of weekly Power Hour, learn about yourself by asking the uncomfortable question "Whom do I envy?" and remember to enjoy the process. Want to get in touch? @gretchenrubin; @elizabethcraft;podcast@gretchenrubin.com; happiercast.com/6; 774-277-9336. Ep: 4: On the One-Sentence Journal, Marathoners vs. Sprinters at Work, and Parking Lot Snacks. Want to get in touch? @gretchenrubin; @elizabethcraft; podcast@gretchenrubin.com; happiercast.com/4; 774-277-9336. Ep. 2: In this episode, Gretchen and Elizabeth vow to set alarms for their bed times, decide if they're abstainers or moderators, discuss how novelty boosts happiness, and share their weekly Demerit and Gold Star. Want to get in touch? @gretchenrubin; @elizabethcraft; podcast@gretchenrubin.com.com; happiercast.com/2; 774-277-9336.